I managed to get window #2 in the other day. I think it looks pretty good, although I need to put some wood trim around it. Oddly it looks a bit crooked from the outside, however the window is dead level, so I’ll have to investigate if perhaps the shutters are crooked. The window went in pretty easily once I had the opening all prepped. Prepping the opening was a bit more difficult mostly due to the crappyness of the 2×4’s that I got from Lowes. The bottom of the old window sloped out heavily and so the outside was much lower than the inside. I wanted to frame up the bottom to bring it to the same height as the inside. Should be as simple matter of taking a 2×4 and nailing it down. Unfortunately the 2×4 was extremely warped, and even after throwing a handful of nails into it, and a few screws (breaking my bit in the process) into it, I couldn’t get it to lay flat. So finally I pulled it out, went back to Lowes and after going through a pile of lumber found a few boards that were reasonably flat. Once I got those in, it went pretty smoothly. This is another case of why you should always budget more than you expect for a project. You see we had started out assuming that the insulation in the walls would be fine. However after tearing down some of the Sheetrock I noticed that the insulation said ‘1.5″ Economy’. That means that instead of the recommended R11->R28 for a outside wall in our climate, we probably had about R6. So I checked out the insulation at Lowes and since it would only be 20 bucks or so to replace it, I figured it would be a good idea. Picked up a couple of rolls of 15″ wide, 3.5″ deep (since we have 2×4 walls) R13 insulation, and was happy to find that its quite easy to install. It fills the stud bay completely, and has nice little flaps that make it easy to staple to the studs. Hopefully the added insulation will keep the bathroom nice and toasty warm in the winter time! Ohh No, a Giant hole in the House! 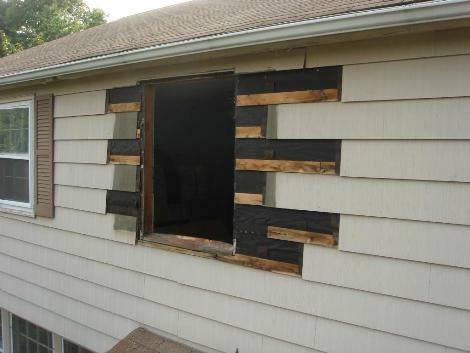 You might ask why in the middle of a bathroom remodel, I decided to replace the window in the front of the house. How I got there is a bit of a long story. You see it turns out, I’m cheap and didn’t want to waste three dollars worth of insulating foam. Perhaps I should go to the beginning. When we decided to redo the bathroom we wanted to replace the old window there. Since it seemed silly to just order one window I decided to replace the front three windows as well. Of course I planned on not actually installing the windows until I had finished the bathroom, but then halfway through installing the bathroom window I realized that insulating the window would only require half a can of Great Stuff foam. Since you can’t really save the foam once you start using the can, I figured it would be a better idea to do another window and use the other half on that. Seemed like a good idea at the time, but now I’m thinking it might have been a better idea to just concentrate on the bathroom and live with spending an extra couple bucks on the foam. After going to Lowes and spending another 250 bucks, we put up another walls worth of tile last night. At Lowes we picked out the shower floor tile, and the grout we are going to use. Also picked up some insulation for the outside walls, some blinds to go with our new windows, and a couple bits of plumbing stuff. I’m hoping this will be our last big trip to Lowes for awhile, which is good because we used the very last of the 10% off coupons we had. Since this was the second wall of tiling, we’re starting to get the hang of it, and it went up fairly easily. We did have a problem trying to get the tiles to lineup with the other wall though. Since this wall wasn’t straight, and since we didn’t want to cut the tiles here, it caused some of the gaps in the tile to be a bit bigger than we would have liked. Hopefully it won’t be very noticeable once we’re all finished. We had to stop about 6ft up the wall, as we’d like to put a row of trim tile there, and we don’t yet have that tile. Last night we put some more tile up, this time around the area where the vanity will go. It’s a bit of a waste, as most of this area will be covered by the vanity, but this way if we ever decide to change to a pedestal sink or a smaller vanity it will all match. It also let us get some practice in on an area where a mistake won’t be noticed. The tiling went pretty easily, although it was fairly slow. Due to the small area, and the pipes and such, a large number of tiles needed to be cut and that really slowed things down. We got into a good rhythm though, with Jess measuring the tiles and me cutting them. The tile saw I’ve got was a cheap little Felker, with a 4″ blade. It works pretty well, although I think its going to need a new blade soon. Tonight we’ll hopefully get a good chunk of the shower done. We can’t do the top two feet or so, as we don’t have the trim tiles yet, but we’ll try and do the rest of it. Put in some nice clean sheets of Sheetrock today. We are going to be tiling this area, however since its considered a “dry area” its ok to put the tile right onto Sheetrock, instead of having to put up Durock. I used only one piece for each wall, which made getting the 8ft long piece into the room, and upright a bit tricky, but the lack of a horizontal seem should make life easier. I also learned that its a much better idea to cut the rock a little short and then spackle the corners (which you have to do anyway) than it is to try and cut it exactly and end up with it being a tiny bit to big in one spot. If its just a bit to big you either have to pull it out and cut it a bit bigger, or attempt to cut it in place. If you try to force it (which of course I did) you end up breaking a big chunk off and ripping the paper. Not a good result. It should be hidden under the tile though so it won’t matter in the end. I learned my lesson and the next piece went up easily and fit well. After much deliberation I went ahead and did the piping for the sink today. The big problem was the drain piping. The vanity we have has drawers on one side, which would have gotten in the way of the drain pipe where it was, so I had to move it to the left a few inches. Using a torch I was able to twist the copper T so that it was pointed correctly. My plan was then to put some copper in, put an elbow on it, and bring it out, nice and easy. Probably would have worked quite well too, except for the problem that Lowes only had a 10ft piece of 1″1/4 copper pipe, and it was $80 bucks. Through on top of that the 10$ elbow, and the 5$ threaded adapter, and I was looking at almost $100 just to move a pipe a few inches. That seemed ridiculous so after a few days of thinking about it with my wife we came up with this solution. I used a flexible rubber fitting to go from the copper T to a PVC elbow, and then put a nice piece of PVC sticking out. Ended up only costing about $10, much more reasonable. I’m not real thrilled with the flexible adapter, but the price is right, and since its on the drain and is easily accessible from the other side if something goes wrong, I figured I’d live with it. We added a ceiling light to the bathroom, it was originally going to be a heat lamp, however we changed our mind and instead just made it a regular light after realizing that the lights over the medicine cabinet wouldn’t put out enough light. We also put in a fan, to try and minimize the amount of moisture in the bathroom, and hopefully prevent the growth of mold and mildew. We tried to get the quietest fan we could, however alot of the really quiet fans were quite large and I think would have looked silly in our small bathroom, so we ended up with this one which isn’t to loud, but certainly not ultra-silent. Did some wiring today. Got up as early as possible and crawled into the attic to install the fan and the recessed lighting over the bathroom. For the fan, we’ve installed a timer switch so that you can just set it to 10 minutes or whatever after you finish your shower and it will shut itself off automatically. It made the wiring a bit more complicated, but I think it will work out wonderfully later on. I would have liked it to be near the door, however with two switches and an outlet already over there, there wasn’t enough room left for another one, so we put it next to the window instead. Today I picked up our fancy new bathroom fixtures. Well I should rephrase that, I went and picked up the medicine cabinet/mirror and the toilet, and then had to have a friend with a SUV come and get the vanity since it wouldn’t fit in my car :-/ got them home and I’m real happy with how they look. I do have two concerns though, the lights over the mirror are not really that bright, so we may need to add another light to the bathroom. My other concern is that the drain from the sink may interfere with he drawers that are in the right side of the vanity. Looks like I’m gonna have to run the drain line a bit to one side so that there is room for it.